3D MicroPrint GmbH is specialized in the production of micro metal parts by Micro Laser Sintering and the sale of the associated machines. 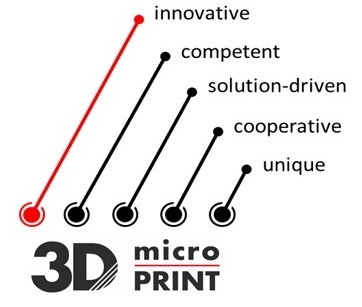 Our company was founded in 2013 in Chemnitz (Germany) as a result of a cooperation between EOS GmbH and 3D-Micromac AG. Experts from both companies have been working with an exceptional pioneering spirit on the development of the Micro Laser Sintering process since 2006. Your requirements for micro metal parts are our inspiration. Thanks to the additive production technology, quality and costs can be optimized while simultaneously expanding the functionality of the specific products of our customers. Over the past few years we have improved our Micro Laser Sintering technology by means of numerous customer and development projects. Many companies, especially in the areas of medical industry, aerospace, semiconductor industry, etc. are already our satisfied customers. We were able to establish ourselves as a solution provider for several industries because of our unique technology, strong shareholders and a strategic investment plan. We are striving to expand this position through our continuous improvement.